For the rest of November, I’m going to take with gratitude some of those things I often take for granted — an entire alphabet’s worth! Since today is the sixteenth day of this surge of gratitude, I am giving thanks for “P” things. Well, one very important “P” thing. Peace. 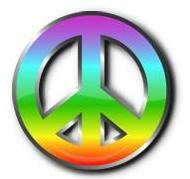 Even if we aren’t beauty pageant contestants, most of us at one time or another have professed to want world peace. We march for peace. We blog for peace. We pray for peace. When we see photos of war in far away places, our hearts go out to the victims. And yet, and yet . . .
All this stated desire for peace makes it seem as if we live in an uneasy world, but according to researchers Bethany Lacina and Nils Petter Gleditsch of the Peace Research Institute Oslo, deaths caused directly by war-related violence in the 21st century have averaged about 55,000 per year worldwide. Compare that to 1.2 million traffic fatalities per year worldwide. Or 295,000 deaths from natural catastrophes worldwide in 2010. Or compare it to 300,000 USA deaths from obesity per year. Or 30,000 USA suicides per year. Lots of dying going on, and very few of it from a lack of world peace. Still, even with all the “we want world peace” rhetoric and all the war talk and heart-rending photos in the media, we take peace for granted. Most of go to sleep at night secure in the knowledge that unless we were to have a health crisis or get hit by a natural disaster or have a car drive through our bedroom, we will wake up in the morning and be able to go about our daily lives without soldiers sniping at us. So today (and every day) I will be grateful the peace that is. So, what “P” things are you taking for gratitude today?